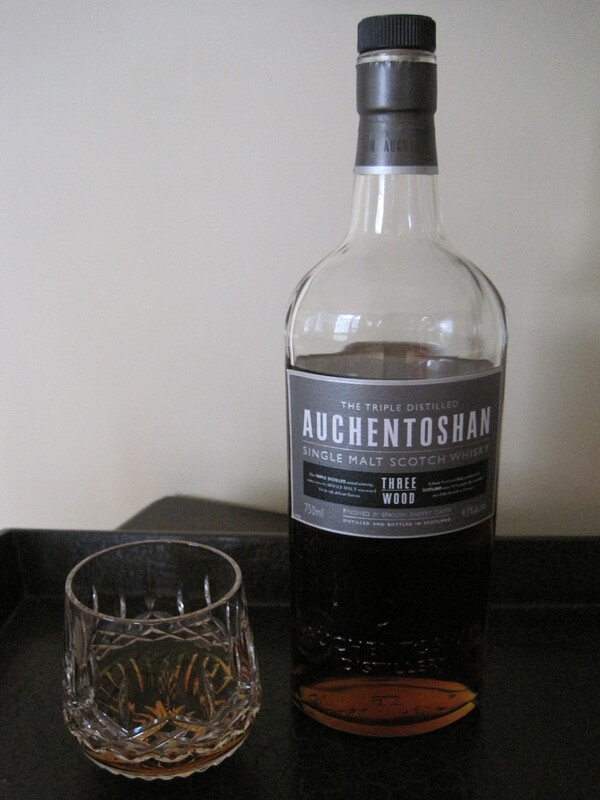 Auchentoshan. How do you even say that? A phonetic pronunciation would be something like “otchin-toshin.” And even though this particular word means “the corner of the field,” this whisky is anything but something you should put into the corner. I’ve enjoyed many Scotches, some of which are members of a very short list of aged regulars that I return to often. And even though I intend to add the Auchentoshan Three Wood to the short list, it almost wasn’t to be — and it would have been because of my own ignorance. The cork popped and before I even poured the first dram, I pressed lowly to this flat-faced bottle’s gate for a sniff. Bitter. Medicinal. Harsh. I was not impressed. I was repulsed enough that I didn’t even pour the dram. I put the cork right back in and went on to find comfort in one of the regulars — The Balvenie 21 year old Portwood. About an hour or so later, I made my way back to the bottle to give it another go. This time I simply poured the elixir and nosed it from the glass — a completely different story — and I honestly don’t know why. Maybe there was a strange funk still adrift and residing on or in my shirt from the last diaper change I’d performed on my youngest daughter. Perhaps my olfactory lobe misfired. With everything going on in my life, I wouldn’t be surprised. Maybe it’s the Auchentoshan distillery smell or a combination of the whisky and some bad glass. I just don’t know. But this time, it was superb. It was soft and fruity. The first sip was no disappointment either. So glad that I’d not forsaken this beauty to be set into the corner of my field, that is, my liquor cabinet, only to be used as a mixer, I swished and savored with awestruck and dramatic style, surprised and enjoying the new friendship. The palate was sweet with slight hints of nuttiness, perhaps fruit juice and almonds. There may even have been a little bit of caramel. And with all of these sensations swirling amidst the rising and falling of my already gleeful sea, I barely noticed the 43% ABV. But I’m not sure if that’s a good thing or a bad thing. The dram finished with class, leaving as gently as she arrived and promising friendly days ahead. I suppose that I learned a lesson here about first impressions. Be kindly disposed and be willing to return for another interaction. There may have been circumstances or unusual dynamics in play of which you are completely unaware, or perhaps they simply cannot even be explained. You may even find that your discernment of an apparent failed first impression geared toward you — like a stern look or an avoiding stare — it may be your fault. Maybe you had a diaper remnant on your shirt and the person was in a state of germicidally emotional self-defense. Can you blame them? Go get a clean shirt. Wash your hands. And go back and try it again. You may find them to be a worthwhile addition to the gathering you trustingly return to with regularity. I just tried the Three Wood today, and after taking a deep whiff of it, I had the very same reaction as you. It’s comforting to know that I wasn’t the only one. Yet I brought myself to try and and enjoy it I did. I completely agree with the rest of your review. Well done. Thanks for the comment, James. I feel better now knowing it wasn’t just me. And glad you enjoyed the review.